W ILLIAM MCGANN was born in Hoboken, NJ. and raised in Union City, NJ where he attended Holy Family Catholic Grammar School. He then moved to Rahway, NJ and attended Rahway High School. He is a graduate of Jacksonville State University, Jacksonville, AL. were he earned his BS degree in Business Administration and Personal Management. He also attended the University of Tennessee, Knoxville doing graduate studies in Special Education. He is a Vietnam Veteran having served fourteen months in country. He returned home where he met his soon to be bride Jane, who was born in Jersey City, NJ and raised in Cliffside Park, NJ. He and his wife were married April 28, 1973 and have raised two daughters. One daughter is married and teachers disadvantaged children and the other works in Philadelphia for the federal government. On June 9, 2001 he was ordained a Deacon by the late Bishop Vincent de Paul Breen, Bishop of the Diocese of Metuchen, NJ and assigned to his home parish of the Church of Our Lady of Peace in Fords, NJ. 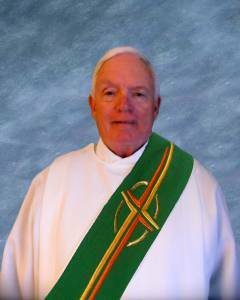 Deacon Bill worked for the NJ Department of Labor (now called the NJ Department of Workforce Development) in various capacities and retired as Assistant Director of the Division of Unemployment Insurance after 35 years of service. He then accepted a job with his parish as the Director of Religious Education. As DRE/Deacon he supervised and participated in most of the ministries in the parish. In November of 2011, construction of their new home in Lewes was completed and he and his wife celebrated Thanksgiving as residents of Lewes, DE. Deacon Bill was assigned to St. Jude the Apostle in April of 2012.